"It must be nice. It must be nice to have Washington on your side." Those outside the microcosm of New York City may not understand or have even heard of the hyperbole surrounding Hamilton -- the most coveted ticket on Broadway -- but it is the logical culmination of a decade plus long resurrection of America' forgotten Founding Father. The musical, originally played off-- Broadway at the Public Theater, ran to rave reviews in its initial New York incarnation. Could that acclaim be topped as it made its Broadway debut in August? The answer has been a resounding yes. We were fortunate enough to attend the September 9th evening show and came away duly impressed with the talent, passion, athleticism, and joy on display to a packed house in Manhattan. 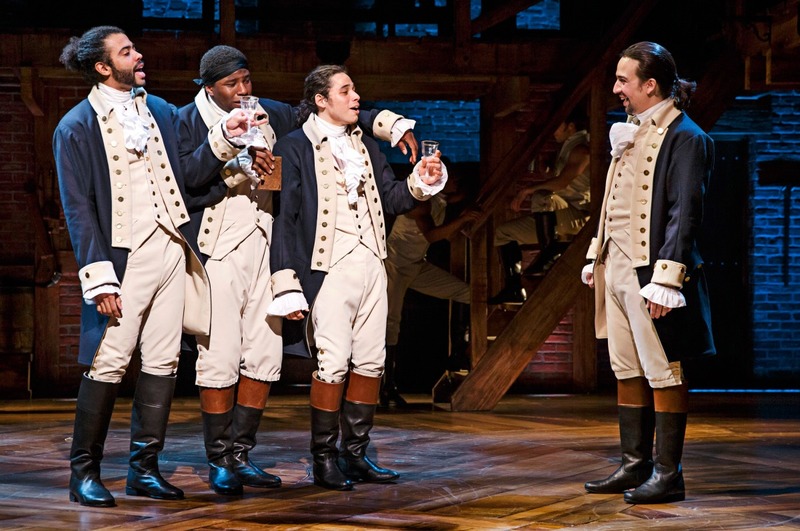 To be clear, the revival of Alexander Hamilton (the person) isn't without criticism. But any such criticism has nothing to do with the artistry of the production; it would be aimed at the arguably Manichean narrative of Hamilton as principled protagonist and Burr as an embodiment of Machiavellian opportunism. In terms of accuracy historians such as William Hogeland have taken exception to Ron Chernow's view (on whose book Alexander Hamilton published in 2004 proved to be the inspiration for Lin-Manuel Miranda's stunning work) of America's first treasury secretary. Hamilton's legacy which is on display for public consumption ignores events such as the Newburgh Conspiracy. Those striving for historical accuracy will claim that Chernow's work paints an undeserving and positive Panglossian color of the Founding Father in a world where that realities of politics and statecraft are anything but black and white. Make no mistake though that despite any historical misgivings, Hamilton the Broadway musical, running close to 3 hours was superb. To the uninitiated it is atypical of Broadway: comprising a cast of color resembling America's urban youth, interjecting a lingua franca of clearly enunciated rap to tell the story as it would be told in the streets of modern America rather than in slavish homage to an 18th America that one may find in a period piece made for PBS. But the delivery of the story isn't a predictable monotonous monologue; the hip-hop prose is interspersed with colonial english, modern R&B and familiar Broadway fare. The sometimes colorful language is balanced by the gravitas of The Federalist Papers, of Hamilton's unlikely rise through the force of his intellect, his capacity to work tirelessly, his proclivity to womanize, and the friendships forged through camaraderie and militancy during America's infancy in becoming an independent nation state breaking away from the empire of Great Britain's George III. 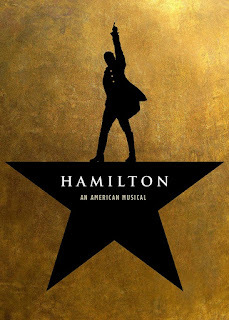 All the while we see stirring performances that complement one another rather than dominate at center stage: Lin-Manuel Miranda’s lead role is played with a gravitas portraying an Alexander Hamilton always running out of time, never satisfied with his lot in life; Leslie Odom Jr. executes with precision the calculating Aaron Burr, confident at the beginning then becoming bemused, befuddled and becalmed by Hamilton's rise when he believed his patience and cunning on the sidelines was the right way forward for success; Daveed Diggs insouciance as the returning Thomas Jefferson in post independence America is counter-posed by his portrayal of Marquis de Lafayette, the French aristocrat with a cause, in Act I during the fight for independence from the British Monarchy; and Christopher Jackson as the steely Commander-in-Chief delivers with a deftness that is animated and fiery. Not to be outdone are the leading ladies, Phillipa Soo and Renee Elise Goldsberry Jones (who played two of the three Schuyler sisters) whose love of theater are clearly on display for the audience to see with their performances that are respectfully measured when necessary and emotionally charged when required -- their scenes required classical Broadway virtuosity and range -- and they delivered. 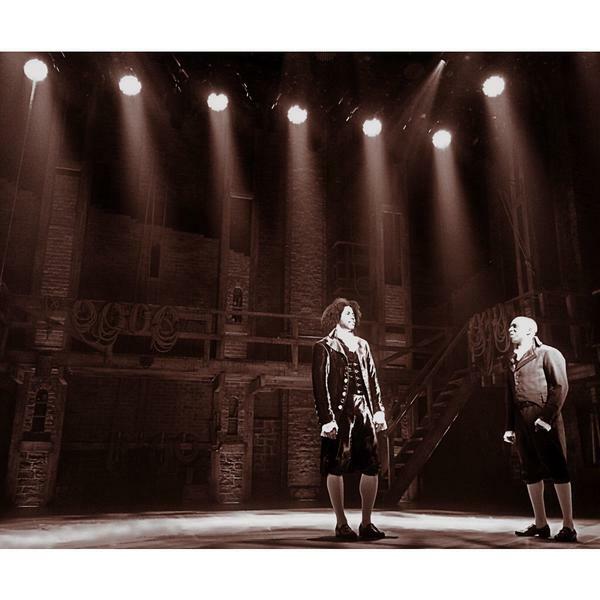 In addition, Jonathan Groff's cameos of King George, where he has the stage to himself, provide the audience with the necessary comedic relief valve as the plot's rising action thickens around him. Indeed, Groff delivers an unforgettable performance fit for a mad King turned jilted lover. Hamilton director, Thomas Kail, Miranda's co-conspirator / co-creator from his Wesleyan University days, must surely be on the short list for the 70th Tony Awards and set designer David Korins illustrates a devotion to his craft in employing a clever revolving stage (reminiscent of Les Misérables) that is there for more than a visual effect; it is an indispensable tool as the production surges forward with Andy Blakenbuehler's choreography that successfully cross-pollinates the flair and mentality of modern hip hop with the rigor of ballet and strut of Broadway show tunes. In our minds there is little doubt that we are seeing the beginning of what will be much more to come from Hamilton the Broadway musical. It will go on tour, it will be made into a movie one day, but arguably its long lasting legacy will be the full resurrection of America's Forgotten Founding Father for the digital generation. Alexander Hamilton's likeness may be coming off the US ten dollar bill but the victory of the supporters of the Hamiltonian project to make Alexander Hamilton part of today's zeitgeist is complete. If you are fortunate to see the Broadway production with this current cast then do so. Runtime 2 hrs and 55 min.